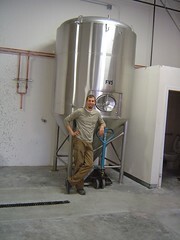 Joel Vandenbrink of Two Beers Brewing poses next to his shiny new fermenter. I don’t get out as much as I used to these days, and even when I do have time to there are many nights I’m content just sitting at home drinking a couple beers, rather than hitting the bars/breweries and scouring for information to post on the blog. That’s where I’m hoping these wonderful internets can help me get some interesting info for posts. The plan is to occasionally do an “email interview”, asking brewers/industry folk “5 Questions from a Lazy Beer Writer”. Most questions will be about beer….and some will have absolutely nothing to do with beer. We’ll see how long I keep this up. First off is Joel Vandenbring from Two Beers Brewing. Thanks to Joel for getting things going. 1) As we can see from your blog updates, Two Beers Brewing is in the process of moving to a new, bigger location in SODO. What can you summarize for people that haven’t had a chance to read all of your posts? Two Beers Brewing Company is undergoing a major expansion in SoDo. We are increasing our capacity and space to better handle the demand for our product. We are planning to brew on our new (new to us) brewhouse the second or third week in May and the tasting room will be open for business shortly after. We couldn’t be more excited about this expansion and know that with this larger brewhouse we will better be able to live into our mission of “take some time. look at the world. gain a new perspective.” We will do this through hosting events for non profits that we believe in and by continuing to donate a portion of our profits to recovery homes for alcoholics. 2) With the new brewery size and growth, you’ll have plenty of room to concentrate on your core beers, such as 20:20 Blonde, Immersion Amber, and Echo IPA. Will you also be expanding into other styles and experimenting with seasonals/special relesaes at all? Most certainly. In March we had a brewers night at Malt and Vine in Redmond and poured an imperial IPA that we are experimenting with and at a brewers night at Beveridge Place we poured an Imperial Amber. So we are already experimenting and plan to do more. Part of the beauty of having a 7bbl brewhouse with a couple small fermenters is that we can experiment, experiment, experiment. So be looking for “one and offs” as the summer continues. We also plan to bring back out award winning Crooked Belgian Wit for three months this summer. 3) Is there anything (beer related) that you are particularly looking forward to this summer? The Fathers Days festival at Saint Edwards Park was a blast last year (our first) and so we look forward to that. We also are looking forward to the Phinney Ridge Summer Beer Taste event. Phinney Ridge really seems to enjoy our beer — we have poured at two Phinney Ridge events and won two awards at them. Personally, I look forward to beer decks opening up again and enjoying some fine summer brews while soaking up the sun. 4) Do you miss anything about homebrewing, since you’ve “gone pro”? Yeah I do. I miss the small batches. I miss the ability to freely experiment and not have to worry about selling it. I also miss the relational aspect that goes with home brewing. Back when I was homebrewing regularly I would have friends over and we would all brew together, share beers together, and talk about “tweaking our brewing systems” together. Now I mostly brew alone with the radio keeping me company. 5) How do you think the Mariners are going to finish this year, and what do you usually drink when at Safeco? It is tough to say so early, but I’m liking how the starting rotation is looking as well as the clutch hitting, so I think they will end up doing quite well. My prediction is at least a wild card and maybe, just maybe a divison title. As to what I drink while at games — as always I try to stay with Washington beer so I drank a Manny’s Pale Ale while at opening day and enjoyed an Ivars Salmon sandwich. Couldn’t ask for a better night.